Once upon a time there were 8 children who were all brothers and sisters. 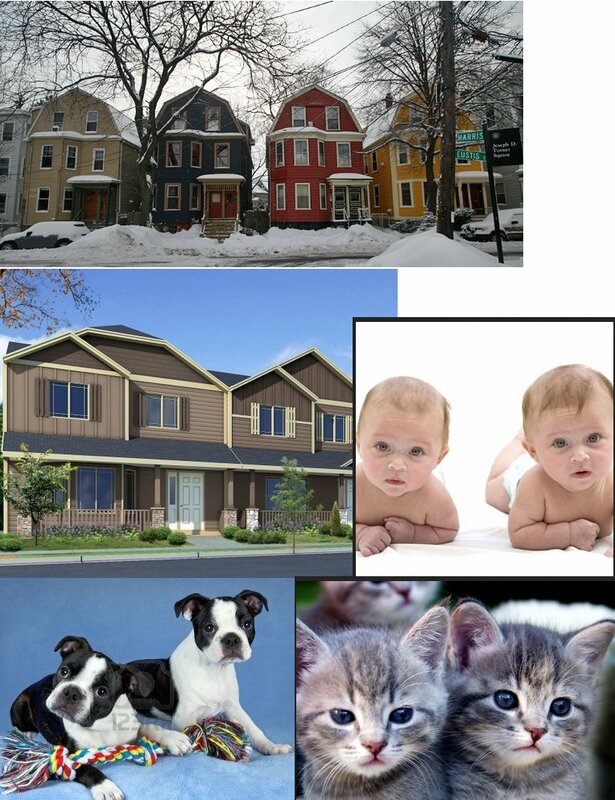 They lived in a large, yellow house near the end of a street that was also filled with similar types of houses containing children of similar sizes and ages. The names of these 8 children were Ethan, Chloe, Matthew, Emma, Nicholas, Molly, Hailey and Josh. (You may recognize some of their names from another bedtime story called “Josh’s Spooky Adventure”, and if you don’t, then I highly recommend that you read it first so that you know what type of children you are dealing with here). 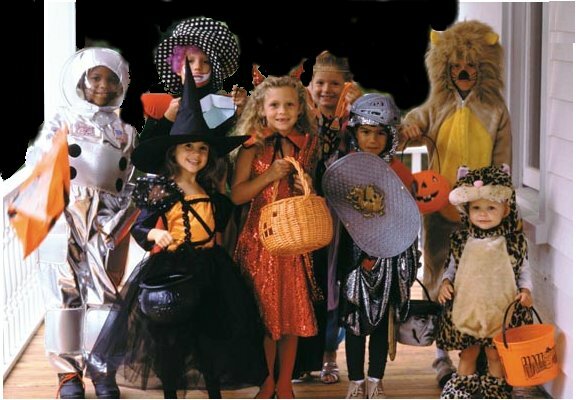 It was Halloween day and the children were very excited to get dressed up in their costumes and go Trick or Treating. Some of the girls had already been wearing their costumes to school every day that week, much to their brother’s disgust. 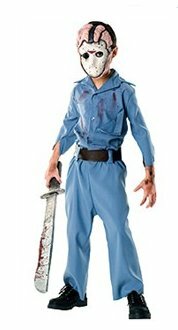 The boys felt that Halloween costumes should be a last minute surprise, and nobody (including parents and teachers) should really know what they were up to. Ethan (the oldest) was a wearing his Soccer uniform (“How original”, Chloe said dryly). Chloe (the second oldest) was dressing up as a Ballerina because she was taking ballet lessons and just happened to have a full ballet outfit on hand. But because it was supposed to be a cold night, Chloe had to wear a white sweater over her lovely costume, which totally ruined the entire effect. “How original,” Ethan replied, just as dryly. Matthew (in the middle) was dressing up as “Jason” from the movie “Friday the 13th--JASON LIVES””, because he had secretly watched it over at his best friend Justin’s house and nobody knew about this INCLUDING Justin’s parents. Emma (also in the middle) was dressing up as a Ladybug and thought this was the most awesome, original costume she had ever worn. 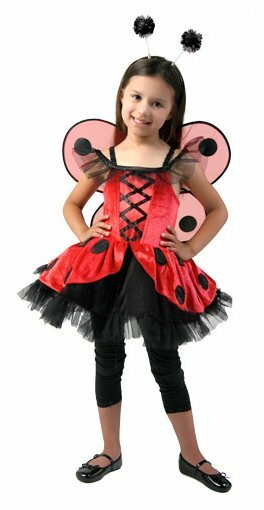 (None of her sisters agreed with her about this, but Ladybug costumes were very popular that year and Emma was nothing if she was not part of the popular crowd). Nicholas, (one of the youngest), was going as a hobo, because he didn’t care about costumes, just about candy. He was wearing black, and was carrying an old Extra Large King Size white pillowcase to collect all his treats in. Molly (also one of the youngest) was going with her best friend Olivia (whom you already know). They were dressing up as identically matched pieces of JUICY FRUIT GUM, which they both thought was very clever. Hailey (the littlest girl) insisted on being a fairy tale princess, which involved her parents spending their hard earned money to buy her a costume. 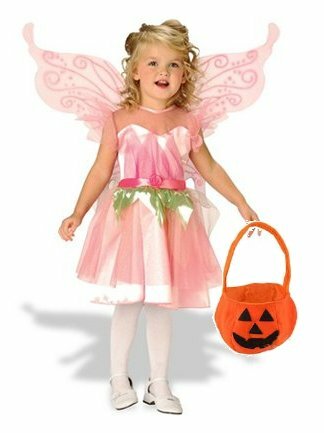 But she didn’t care, because she only wanted to be a beautiful fairy tale princess, show off her wings and gorgeous outfit and carry her little orange pumpkin tote around to collect candy. (Halloween was a very important holiday for Hailey). Little Josh (the youngest) was left with nothing to wear, so his mother searched and searched and eventually found an outdated costume that she had made for Nicholas the year before. 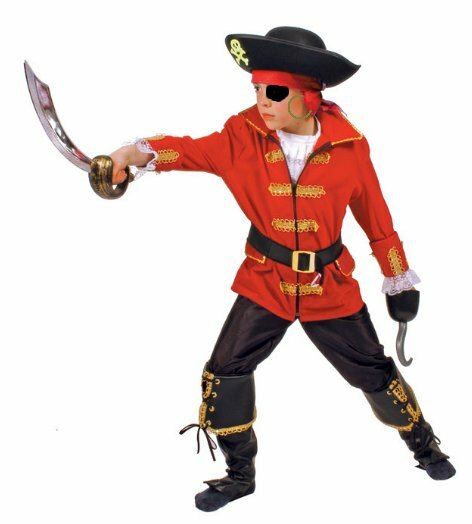 In the end, it turned out to be the best costume of all, as Josh was dressed as a fierce Pirate complete with boots, breeches, a bright red shirt, a plastic sword and a black eye patch. He was also smart enough to find a pirate’s earring made out of an old shower curtain ring, which he hung off his left ear. I felt this was extremely clever of him, don’t you? 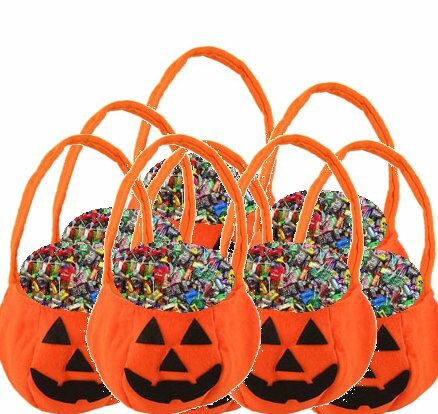 After about an hour of intense activity on everyone’s part, all their pumpkin totes, shopping bags and pillowcases were filled to the brim with treats. They returned to their house and sat in the driveway to divide and trade the best candy bars and snacks between themselves. (Sometimes it really does pay to be part of a large family). Then everyone was ready to go to go to Olivia’s house for the Haunted-Halloween Sleepover party. Still in costume, they ran, skipped, and in a whirlwind of golden, red and green leaves falling around them, flew up the street. There were beautiful brightly lit pumpkins on every porch, and many other children in costumes running up and down the street. 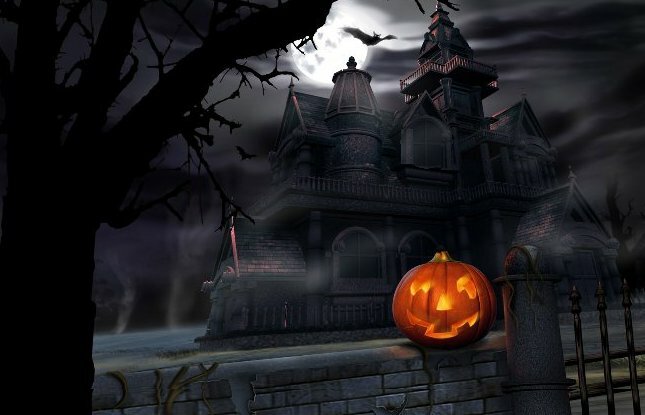 However, when they arrived, the house was not lit up at all, except for one grim smiling pumpkin glowing dimly outside.There were no parents, lights or candy anywhere to be seen. The children all climbed slowly up the porch stairs and walked into the dark house. “Mom, Dad?” Olivia asked timidly, but no one answered. When they all got inside, and put down their treat bags, they realized that something was very wrong. Olivia heard her mother’s voice coming from the kitchen, and she and the children ran in there to see what was going on. Olivia’s mother had just gotten off the phone with their parents and explained that there was a huge storm coming, possibly at any minute, and they had already lost power. The children would have to sleep in front of the fireplace in sleeping bags and probably survive only by eating roasted marshmallows on sticks. The boys thought that this sounded like an excellent idea, but the girls were not as thrilled. “How will we do our hair and put on our makeup in the morning?” they wanted to know. (The boys snickered at this last comment, as No One in their family was allowed to wear makeup yet). Ethan and Matthew both felt that this was a great opportunity to teach everyone, hands on, about “Survival in the Wilderness”, (as their troop leader in Scouts had recently discussed) so they decided to set up camp in front of the fireplace. 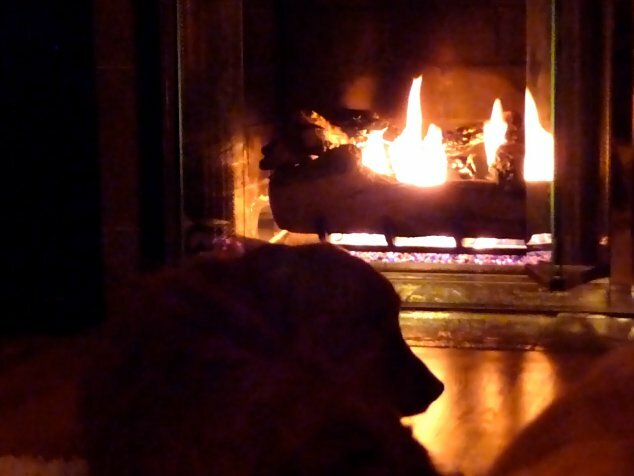 Just as they were beginning to give their lecture, the storm hit, and everyone ran into the living room to be near the warm fire. Ethan immediately took charge, and, still in his soccer costume, made sure that everyone was safely huddled together under blankets. The storm grew closer and thunder and lightning loomed nearby. With every boom of thunder and every crack of lightening the children jumped under the blankets. Suddenly, out of nowhere, a ghostly apparition appeared. It was quite large, with a white sheet over its head, two big eyes, and a large mouth that appeared to be very hungry. Everyone huddled together in front of the fireplace in fear. This was CERTAINLY not what they had expected for Halloween! The thunder and lightning continued for quite some time, and everyone was very glad everyone else was next to them for company. 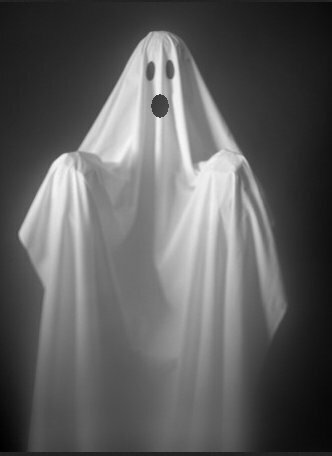 Eventually, Olivia’s father came out (after removing his ghostly white sheet), and told them what a fun time he had trying to scare them. He said he remembered HIS father scaring him in the same exact manner when HE was a little child, but no one found this amusing. 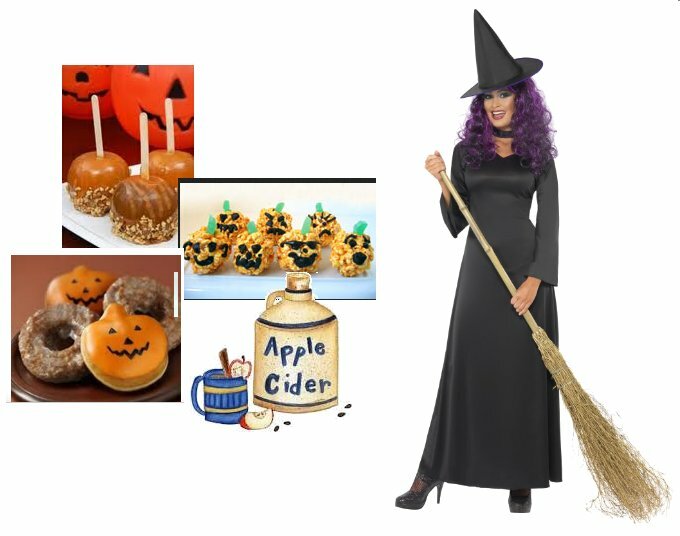 Then Olivia’s mother came out and invited everyone into the kitchen for apple cider, homemade pumpkin donuts, popcorn balls and freshly dipped caramel apples. She wore a witch’s hat and black pointed shoes but otherwise looked just like an ordinary mother to them. Suddenly, the lights came back on and power was restored to the whole house. Everyone breathed a deep sigh of relief, but after eating as many donuts, popcorn balls and candied apples as they could, the children still wanted to sleep in front of the fireplace in sleeping bags. From tallest Ethan down to littlest Josh, everyone agreed that this was the BEST Sleepover and Halloween party they had ever been to. And Olivia agreed. Ballerina-(bal-ler-REE-nuh) (Note: "bal" rhymes with "sal", like the first part of Sally) A girl who dances Ballet is known as a Ballerina. Ballerinas are strong and graceful. Both girls and boys can dance Ballet. A boy who dances Ballet is known as a Danseur (dawn-surrr). He would have to be very strong (to be able to lift a Ballerina high into the air), and he would also have to be as skilled, and talented, and have a sense of timing every bit as good as an Olympic gymnast. 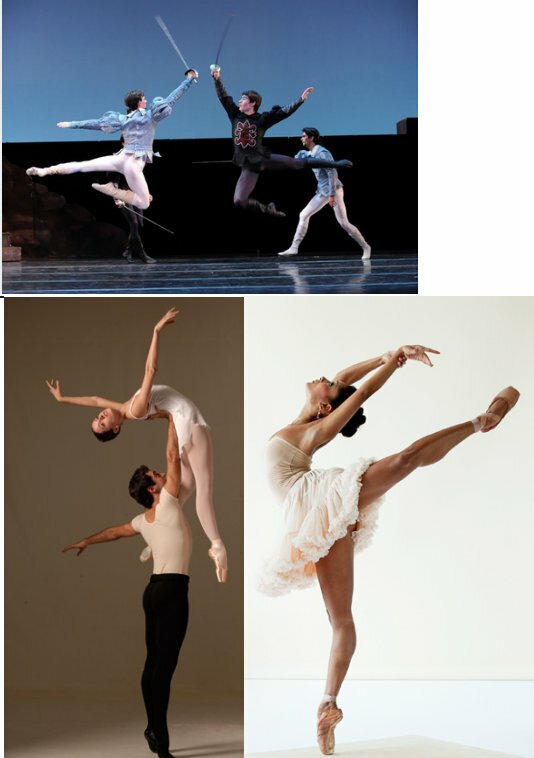 Here is a photo of Ballerinas and Danseurs. Ballet- (bal-LAY) (Note: "bal" rhymes with "sal", like the first part of Sally) Ballet is an art form created by the movement of the human body. It is theatrical--a story without words, expressed in movement, set to music, and performed on a stage in front of a theatre audience, using costumes, scenic design and lighting. Ballet can tell a story or express a thought or emotion. Some styles of ballet require special shoes with flat tips (Ballet Pointe shoes) that allow Ballerinas and Danseurs to dance and twirl while balancing on their toes. 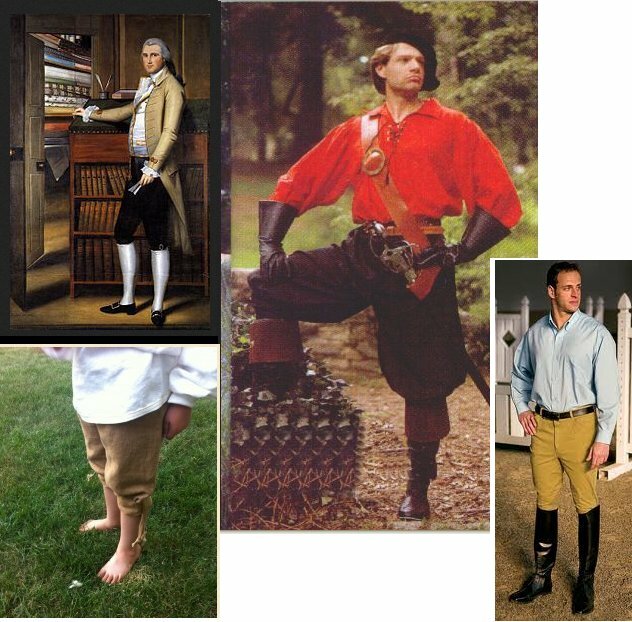 Breeches- (There are two accepted ways to pronounce this word; breech-iss which rhymes with beaches, or britch-iss, which rhymes with itches) Breeches as used in this story are half length pants. Pirate costume styles usually stop right below the knee. Today some horseback riding pants can also be known as breeches and they tuck into long boots. Brim-(brim rhymes with rim) Brim means the uppermost edge of a hollow container, (like a basket, or a box, or a glass, or a bowl, or a cup). 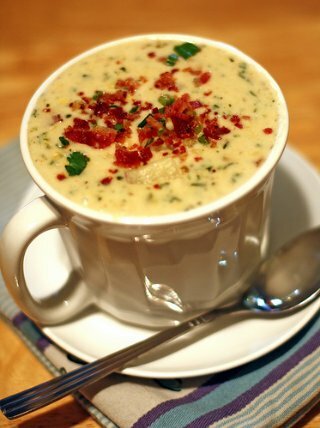 If you filled a cup to the brim with hot soup, that would mean the cup is almost ready to overflow and spill into the saucer. Disgust- (dis-GUST) The feeling you get when you see something or you smell something you think is totally gross, is an example of disgust. Similar-(SIM-a-lur) Almost the same but not exactly. Many things, many features, but not all of them, look the same. Huddled- (HUD-dul) Hud rhymes with mud. Huddled means getting really close. 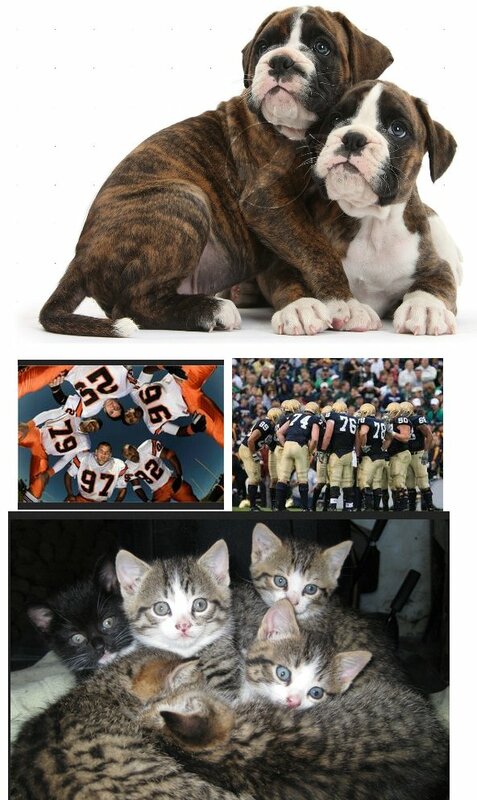 You could be huddled together, snuggling up to each other to stay warm, or for protection, or sometimes you could huddle to whisper a secret, or you could join a huddle of athletes on your team to call a football play. Ladybug - (LAY-dee-bug) What a neat Ladybug costume Emma is wearing! 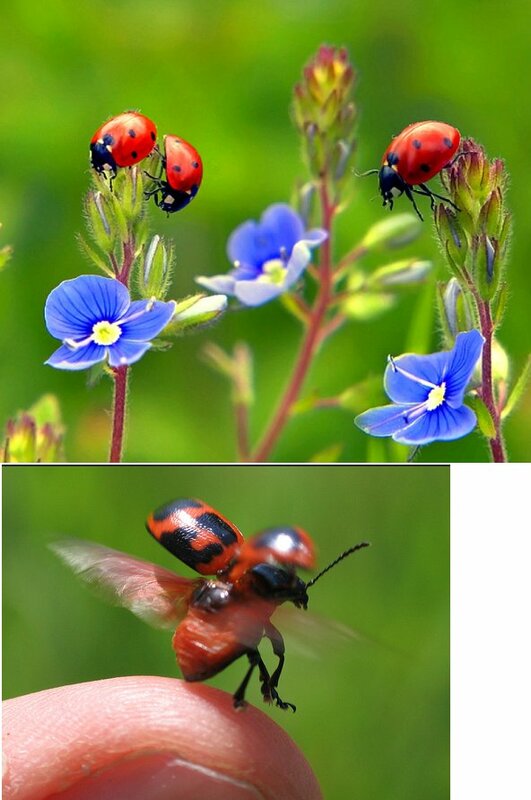 Did you know that Ladybugs are real creatures?. The tiny little ladybugs are also considered good luck!. Most people like them because they are pretty, graceful, and harmless to humans. But farmers really like them a lot because Ladybugs eat aphids and other plant-eating pests. One ladybug can eat up to 5,000 insects in its lifetime! Lecture - (LEKT-chur) A lecture is a presentation by a speaker (or speakers) who have come to talk to people and teach them about a particular subject. Much of the time lectures are held in auditoriums or theaters or classrooms. Since the lights went out, and everybody was all gathered together anyway, Ethan and Matthew were going to use that opportunity to lecture the other kids on how to Survive in the Wilderness. That means they were going to teach them how to stay alive and safe until somebody rescued them, in case any of them ever happened to get lost in the woods. We actually think that would be a VERY good thing for ALL kids (and their parents) to learn. Outdated - (Out-DATE-tid) Outdated refers to something no longer usable for its original purpose. The Pirate costume the children's mother made especially for Nicholas was intended for wear last Halloween, a date that was a whole year earlier. Since Nicholas has grown like a weed over the past year, the costume no longer fits him. Therefore, the Pirate costume is outDATED. When your family buys milk in a carton you'll see that it is stamped with a date. If you look at the date stamped on the carton and it is WAAAAY past that day, the milk is outdated and it's usually a good idea not to drink it. Clothes can be different, though. For someone who knows how to sew, Nicholas's old costune could be cut down and made smaller to fit a little kid, which is exactly what Josh's Mom did. Relief - (ree-LEEF) Relief is the way you feel better and can finally relax once whatever was worrying you, bothering you, or hurting you has gone away. If you catch the flu and the doctor gives you something to make you feel better, you also feel relief. The kids were worried that if the electricity didn't come back on there might be no way for their Mom to cook breakfast in the morning and the TV and the computer wouldn't work and besides, it might be scary with all that dark, so they breathed a great big sigh of relief when the power came back on. Restored-(ree-STORD) To put something back the way it originally was. When the electricity came back on in the children's house you would say that power had been restored. All of the electrical appliances, like the lights and the TV and computer and the refrigerator and the stove and the toaster and the microwave would now work the way they originally did before the storm knocked the power out. Here's another example; Say your bedroom was nice and neat and clean and all the toys were put away. Then you had a sleepover with friends, and in the morning your room was a total mess. Once everybody from the sleepover pitched in and helped you clean it up again, you could say that your room had been restored to its original nice, neat, and clean condition. 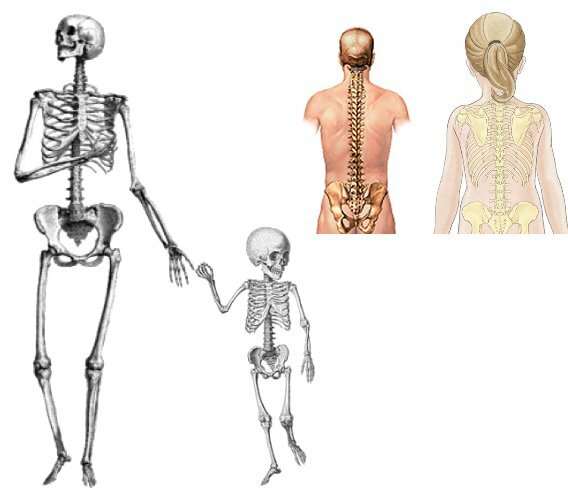 Spine-(spy-nn) Your spine is that line of bones that starts at your neck and runs all the way down your back. And sometimes.... when you feel a tiny bit scared, you might experience what seems like a little bit of a shivver running all the way down those bones. Survival-(sir-VI-vul) Survival is the act of staying alive. Timidly- (TIM-id-lee) Timidly means shyly, and maybe feeling just a little bit scared. Tingling-(TING-ling) A sensation in your nerves that feels like a sharp little prickling or a shivvering or quivering. 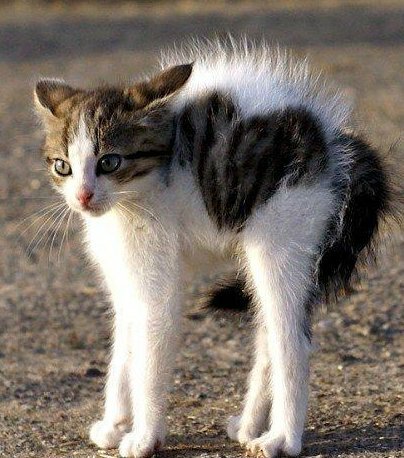 Spine-tingling is a reaction to either being spooked (very much like an animal sensing danger and having all of its fur on its spine standing up on end) or a human experiencing something so personally moving that it sends chills right down their back. The spine-tingling sensation can happen all of a sudden, and it might also cause goose bumps or chills. Tote- (TOEt) This is another of those words which can have more than one meaning. To tote means to carry something heavy. A tote can also be used to describe a bag or a big purse or a container of some sort used to carry something heavy IN. in this story the kids were using Pumpkin design totes to carry their Halloween candy in.